Although Chase Elliott will move up to a full-time ride in the NASCAR Xfinity Series™ in 2016, he still plans to return to the series in which he won the championship in 2014. In only two seasons in the NASCAR XFINITY Series™, the young driver has already posted four wins, 27 top fives and 48 top 10s while driving for JR Motorsports. Next season, he will take his turn behind the steering wheel of the No. 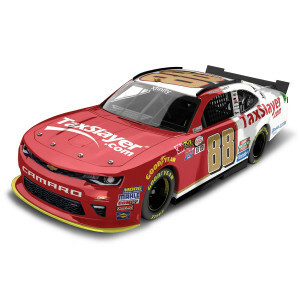 88 TaxSlayer.com Chevrolet Camaro in select events for the organization. Now Elliott fans can purchase an Action Racing Collectables die-cast of his No. 88 TaySlayer.com Chevrolet Camaro from Lionel Racing. Each red and white die-cast is certain to become a favorite among any collection. Each Limited Edition Action Platinum Series 1:24-scale hood open collectible die-cast includes manufacturer-specific engine detail, die-cast body, die-cast chassis and detailed interior. Each collectible die-cast also features a DIN (Diecast Identification Number) for registration as well as a silver sticker with 1 of 0000 indicating production run size.